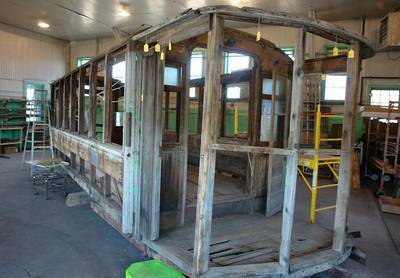 The H/L&CHPC is restoring a streetcar that operated between Fort Harrison, the State Nursery, Helena and East Helena between 1909 and1927. Much of the basic work has been completed by volunteers and students at Capital High School who are using the restoration as an interactive learning project. 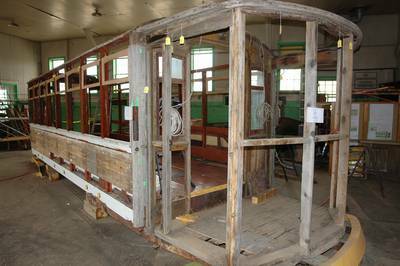 Currently, repaired parts and new pieces are being re-attached to the old streetcar. This is an exciting and important undertaking that involves many community members. You can be part of this project. Please call 447-8357 or email to participate. What was called the Helena trolley system was really an inter-urban line (one that connected multiple communities) that joined major institutions in southern Lewis & Clark County. It began in 1883 when Helena Avenue was planned to connect the new Northern Pacific Railroad Depot in the 6th Ward to downtown Helena, a mile away. By 1886 a horse-drawn car on rails was hauling passengers down this street and plans were underway to expand streetcar service throughout the community. Horses were soon replaced by small steam locomotives but these proved offensive to eyes and ears and an electrified streetcar system was in operation by 1890. Rail lines criss-crossed town, running down Main Street and out into the surrounding lots to encourage development for miles east and west of Last Chance Gulch. The State Nursery, Broadwater Hotel, Fort Harrison and points west of town enjoyed the convenience of trolley service. On the other side of town the new smelter was connected so that workers could commute to East Helena. The streetcar business was competitive and more than one company was in operation here during the early years, causing much disruption and division. Consolidation eventually came but the business was often struggling. Nonetheless, service was relatively consistent through 1927 when pressure from the automotive industry and personal automobile use forced trolleys off the streets. When the lines closed the cars were sold or scrapped. 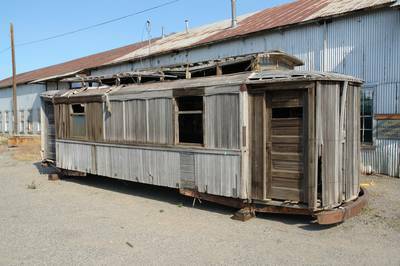 Helena Trolley # 3 survived as a ranch bunk-house until purchased by a collector in the early 1950s. It passed into the hands of a restorer in 1994 and was donated to the City of Helena in 2005. The local preservation commission was charged with its refurbishment. Joining with Capital High School, the H/L&CHPC developed a multi-objective educational program around the car, inviting classes ranging from photography to computer science to assist in the restoration. Woodworking projects, video interviews, 3-D computer graphics and other school activities have been the result. 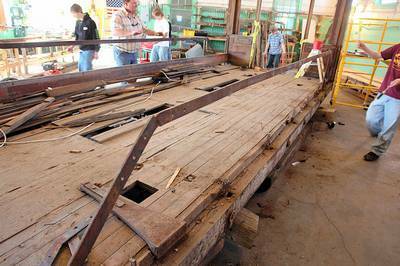 Grants, donations and City funds have supplied materials and volunteers provided other labor. 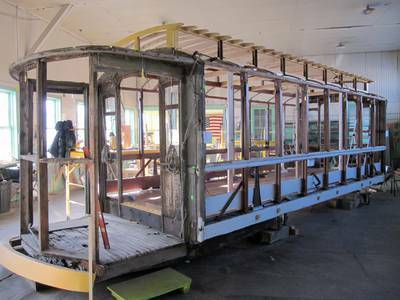 The Helena/Lewis & Clark County Historic Preservation Commission wishes to acknowledge the skillful dedication of the late George Hoff whose work on the trolley restoration took the project quickly to its current state of repair. A committee of the Commission carries on George’s work. The staff and students of Capital High School also warrant the Commission’s sincere thanks as does the Lewis & Clark County Historical Society. Fall, 2006. The streetcar after being returned to Helena. Old siding attached when the car was a residence still blocks the windows and former doorways. October 2008. After dismantling by Capital High students. Each part was repaired by cutting away damaged sections and implanting new ones or replaced using the same wood type as the original. Fall, 2007. The car is stripped of old siding and with parts labeled for dismantling. By this time it has been digitally recorded inside and out. April 2009. Reconstruction in progress. All the posts, restored and reconstructed, are in place. April 2009. 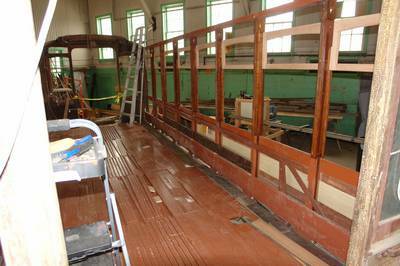 The new floor is in and all recreated upper windows are installed. December, 2009. Topped off. Next, wiring, interior panels and slat roofing.